Yesterday Dave & I went to M&T Bank Stadium in Baltimore to watch the underachieving Ravens take on the division leading Pittsburgh Steelers. The game went as I feared it might although we won in Pittsburgh earlier in the year we usually split so was hoping we could pull it out but could not losing 23-16. 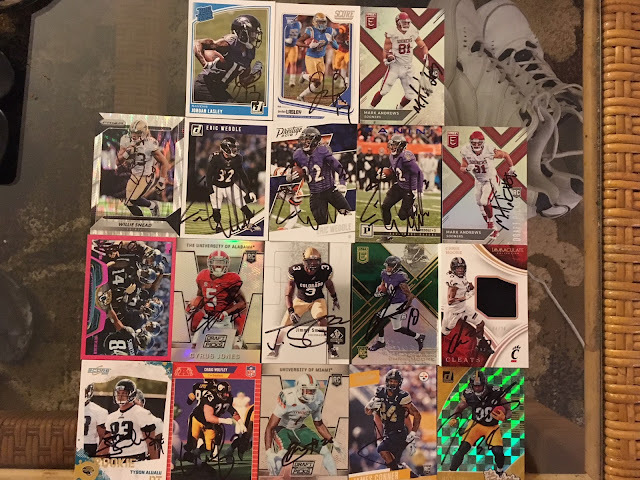 We did autos before and after was a great day a lot of the usual pregame signers didn't sign so was not as productive as I was hoping but was able to get some and a few good ones. I was able to get a total of 36 autographs from 25 Players. In addition I was able to get Mike Hilton's glove before the game and Marlon Humphrey hat, Pair of gloves from Gus Edwards and a glove from Patrick Onwuasor gave Dave the other one. 1) Nick Boyle - 8x10. 2) Tyus Bowser - 8x10. 3) C.J. Mosley - 2 8x10's. 4) Alex Lewis - 8x10. 5) Matt Judon - 8x10. 6) Chris Moore - 2 Cards & 8x10. 7) Bradley Bozeman - 8x10. 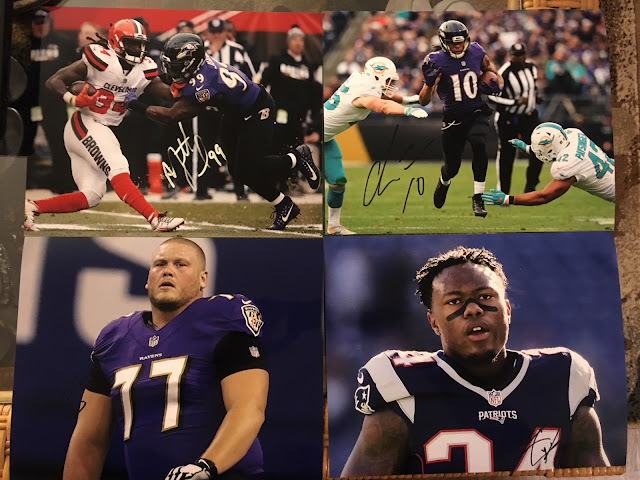 8) Cyrus Jones - 8x10 & a Card. 9) Eric Weddle - Program & 3 Cards. 10) Brent Urban - 8x10. 11) James Urban - 3x5. 12) Michael Pierce - 8x10. 13) Jordan Lasley - 2 Cards. 14) Mark Andrews - 2 Cards (1 Smudged). 15) Willie Snead IV - a Card. 16) Jimmy Smith - a Card. 17) James Conner - a Card. 18) Jaylen Samuels - a Card. 19) Craig Wolfley - a Card. 20) Artie Burns - a Card. 21) Tyson Alalau - 2 Cards. 22) Mike Hilton - Glove & Blue Print. 23) Jon Bostic - Blue Print. 24) Ryan Switzer - Blue Print. 25) Tyler Matakevich - Blue Print.